We went out west this afternoon. It’s been a long time coming, this latest trip to Fulshear. 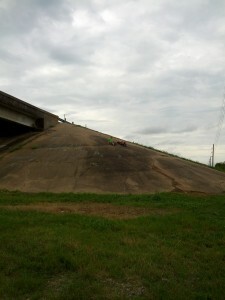 We hid some geocaches out there in 2012, and a few of them haven’t been found in a while. One of the things on my list that I wanted to do when I recovered from my leg injury was this very trip: cache maintenance, exploration, and a little cache finding. 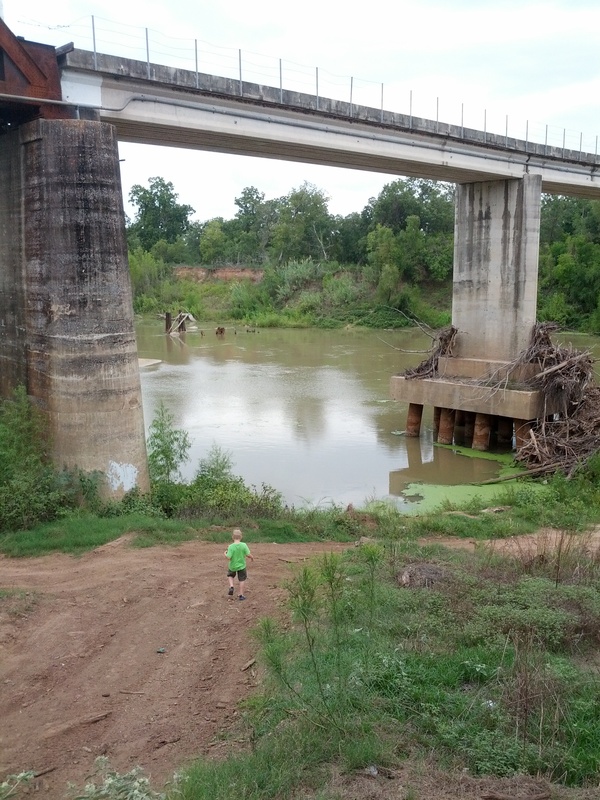 This area is one of TPWD’s canoe launch sites they built in late 2011. I have yet to see the canoe launches they built out here show up on an actual paddling trail listing on the TPWD website, but this place does seem to be popular with people wanting to fish, play in the river, and shoot guns. The boys almost always find 12 gauge shotgun shells down here when we go. In the top picture, the fishermen on top of the bridge support had just walked up there – that was not possible last time we were down here. The waters have receded a lot. You can see the pile of branches on the supports showing the level the water had been at before. We have been to this canoe launch quite a few times, although never to actually launch a canoe. There are a lot of trails that go on past where we have our cache hidden. Someday, we might hide more. I let the boys explore a little within eyesight of me, but the inclines on the trails were too great for me to follow them right now, being just a week and a half post leg surgery. I still have stitches in my leg and barely can handle any distance or terrain changes for the moment. After this, we headed to the other canoe launch out here, about 3.4 miles away. For people who don’t canoe, we sure seem to spend a lot of time at the launches. We were here to check on another cache, named for a Sasquatch story a cop told us out here. It is also the site where a cross marker lay in remembrance of two people who were murdered near here and whose bodies were found in the river. Today, there was another body out here, although we are fairly certain from the shape it was animal in origin, and not a human. We noticed it when we parked, a brown roundish lump laying on the ground in between the parking spot and the cache site, not 20 feet from the cross. We thought it was a dead deer, but when we got closer, we realized the brown color came from the blanket that was thrown over it. There were maggots crawling on the blanket, and when my oldest son (foolishly) threw a small rock at the decomposing body, you could see the ripples underneath of what certainly was a huge colony of maggots making work of this carcass. It started to smell and we were disgusted and walked away, none of us having the guts to lift the blanket and see what was underneath. From the body shape, we suspect it was a large dog, or perhaps a pig or other small livestock. 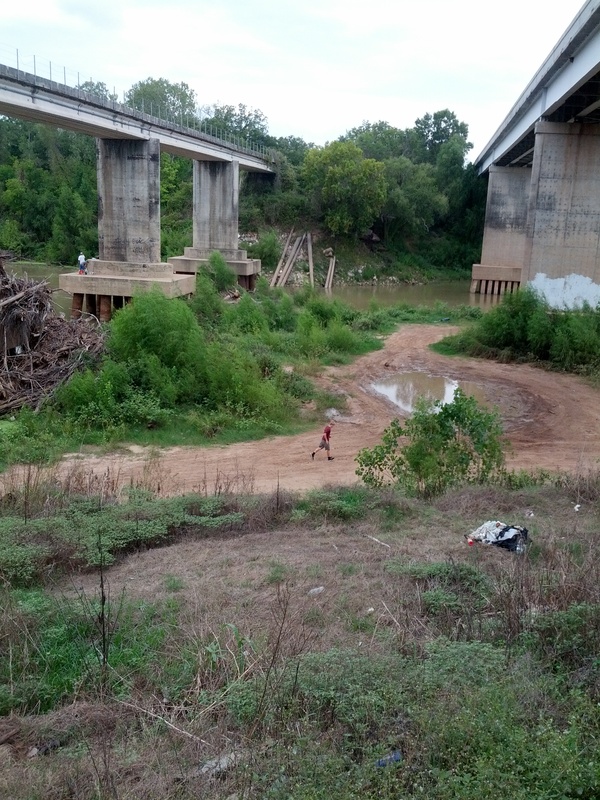 This picture of the kids sitting on the culvert just to the right of this disturbing find. Ew. 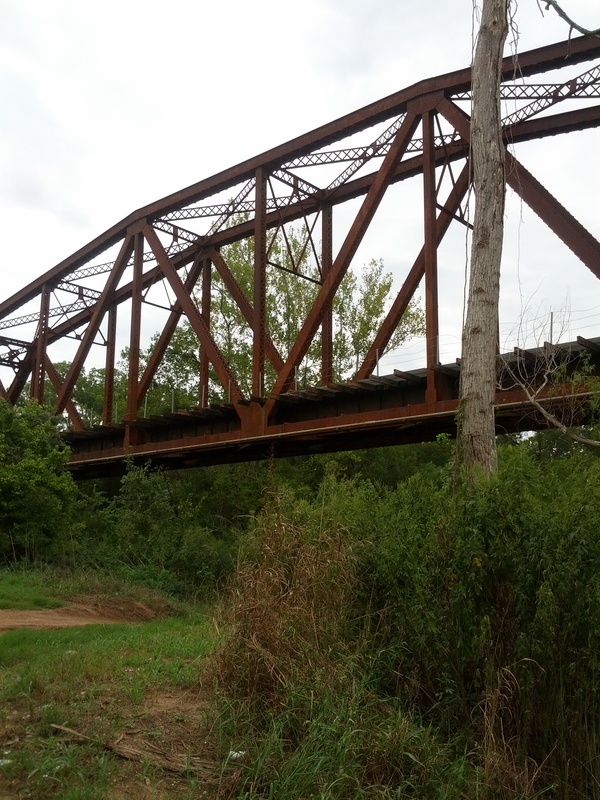 After this, we were going to head for a small series of caches we have hidden on a country road about 6 miles east, but we decided to take a scenic backroad diversion to get there and then ran out of time. Instead, we found a shady country road that might be ripe for a new cache series (although the nearby residents that we saw outside their homes were causing us to question this choice – it seemed like sort of a rough area – it had a “Deliverance” meets South Africa kind of feel to it, with unfriendly eyes and condemned shacks – which was a surprise because the road backed up to a very nice high end neighborhood). I really enjoyed this cache, it was everything I like about caching. It was a short, scenic walk from parking, and we saw a blue heron and a great white egret in the pond. While signing the cache log, we saw some striking red, purple, and white flowers, as well as an interesting looking beetle. We saw a spider web with a small black spider with a white back on the walk back, and then we heard some bird just going at it, so we looked around to identify them. The smallest of our boys said it was probably a boy and girl boy talking to each other, and even though he got in trouble for talking so loudly and potentially scaring them off, he did appear to be right. Team Four Paw was also right when he speculated about it being woodpeckers. Two red bellied woodpeckers were getting into it, chasing each other around and tweeting. Well, on second thought, maybe it was two males and not a male and female – maybe they were fighting over territory or something. It was neat to see though. Thanks for the fun little outdoors experience for the day. These are some of the flowers I saw. 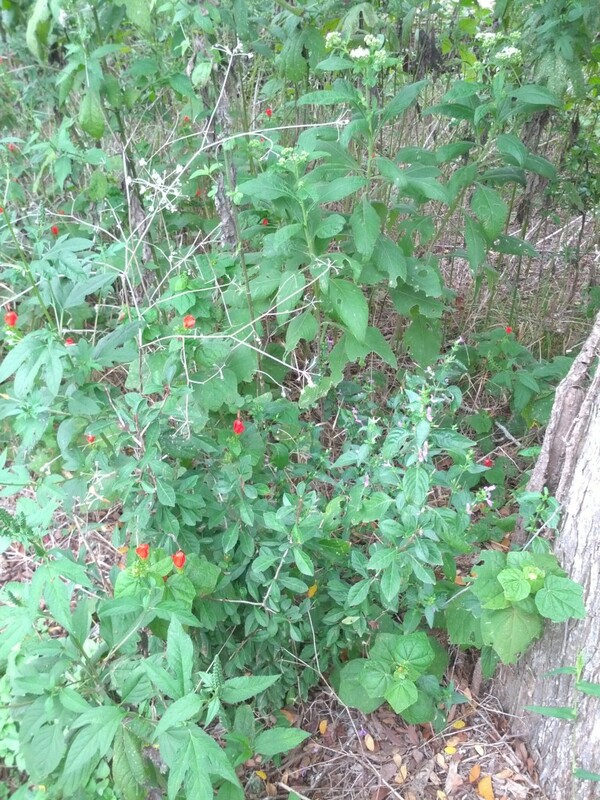 Took me a while to identify these flowers because I am not that good at it, but I finally found it: Turks cap, or Malvaviscus drummondii. Here is another shot of them up against a tree. Too bad I didn’t get a picture of the woodpeckers. I did get one of the beetle we saw, but it is not in focus. The spider web would have been cool, but was too hard to try to capture with my cell phone camera. I think the boys had fun, even though they were quite happy to be headed home after this. I feel good about finally maintaining my caches, and about getting out of the house. Hopefully, after I get my stitches out, my leg will actually heal up with no more problems and I can start hiking again. 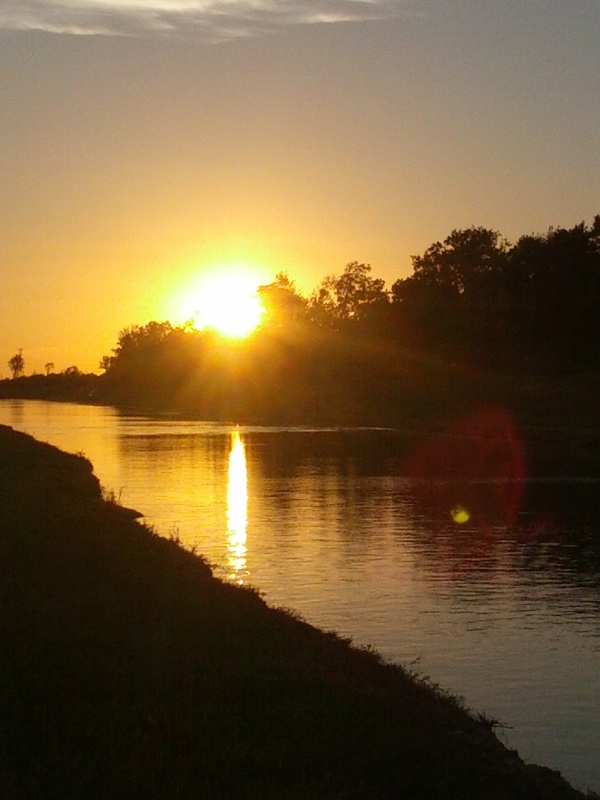 We went for a walk tonight – my boys, my dogs, and I. We went for a super-secret walk, in a place no one could find us. We went for a walk in a place we weren’t supposed to drive to, but we did it anyway. The dogs went for a swim tonight. The water was a little shallow, maybe a little scummy. 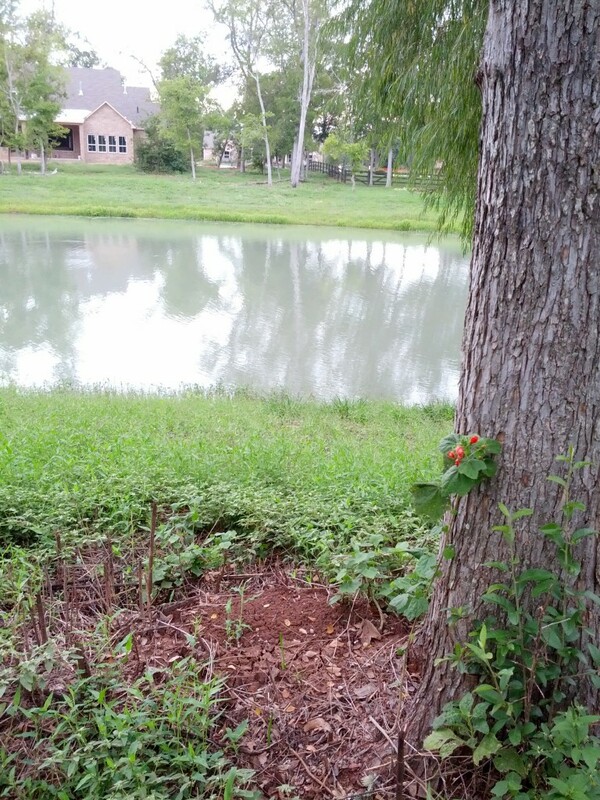 It is possible there was an alligator, we found out later. We let them swim anyway. My little son, I’ve been wondering about him. About six months ago, we had to put down a family dog that had been with our family for fourteen years, which is twice the sum of little son’s years. The whole sum of little son’s life had taken place beside this dog. Yet, when we came out of the vet’s office after saying goodbye, we had a moment that I have pondered over these months since. The older son and I were bawling our eyes out, and this little one tried that with us for a minute or so, and then just opened his eyes and looked at us. “Do we have to cry about this?”, he said. We both looked at him in astonishment. “No,” I said, “you don’t have to.” Then in unison, my older son and I both added, “but we want to!” and kept on bawling while this little son just sat up, relieved. I have wondered about what this means since then. J says it is just normal, he is a seven year old boy, they don’t always understand or are in touch with their emotions at this age. One of my best friends, though, suggested that it is not normal not to cry after losing a family pet, and suggested he might be a sociopath. “A sociopath?” I asked. “Oh, don’t worry…not all sociopaths are murderers!” she tried to reassure me. She said it was just a disorder where people did not have empathy for others and only cared about themselves. I tried watching him for this, but I wasn’t sure. I mean, he IS seven – there are times he cares about himself. But he also does seem to care for others, and he especially enjoys the pets at the house. As we were walking, the dogs came running down a hill, and there was a bird walking around on the path. The bird was making a lot of noise, but didn’t fly away as the dogs ran past it. The Lab jumped in the water, but the Aussie stopped to check out the bird and considered mouthing it for a minute. I told him to leave it alone, and he did. “I know, Mom,” he said gently. He just wanted to look at it. “It has a broken wing,” he observed. He watched it run up the hill, towards the comfort of overhanging brush. “I feel bad for that bird,” he said, turning back towards me. And then I knew that there was nothing wrong with him. That he was just a normal seven year old boy. Maybe he didn’t experience his emotions the same way that day with Rascal, but he was capable of caring about others. I asked him about that day with Rascal, why he didn’t cry. “I just didn’t understand why were crying over that,” he said. “Were you sad?” Yes, he had been sad, he said, but it made sense. Rascal was hurt, and then he wasn’t hurting anymore. He misses him, but it made sense. Now, my Aussie, who had spent the whole sum of his life as well (except for a few months as a pup) next to Rascal, also had been adjusting to life without his dog brother. The Lab as well had lost her life partner, our other Lab, last fall. The past six months, we’ve seen their relationship dynamic changing. At this moment, it was sinking in to the Aussie that the Lab, as well as two of his people, were on the other side of the retention pond. As much as he didn’t like swimming, and had resisted thus far on the walk, he finally couldn’t stand the separation from her, and jumped in to swim towards her. She saw him, and jumped in to and swam out to him. They met in the middle, nosed each other, and then she swam with him back to the side where J and my older son were, being his moral support for his swimming fears. It was the sweetest thing. I tried to get a picture, but all you can see here is the sun setting. The sun setting on the sweetest thing you couldn’t see; a bird escaping to live another day, a boy who really was just a boy, and two dogs who’ve learned to love and support each other after their respective partners have passed away. There’s been some talk about the Keystone pipeline, and I have been thinking about it some more since the recent train oil spill in Quebec. I think there is some misinformation out there about the addition to the Keystone Pipeline. I was going to write a big long story about it to clarify the facts, but I like this version better than anything I would write about it, so you can check it out if you want. 1) I am not thrilled with the “eminent domain” issues. It concerns me that land can just be grabbed from private citizens for “the greater good” of putting a pipeline in that not everyone wants. 2) Ultimately having quicker access to the refineries is not going to bring down the price at the pump for gasoline. Oil goes to a great number of things, gasoline only being a small part of that. 3) The oil that will be flowing in the pipeline is not “American” oil, we don’t have rights to it. It is Canadian oil, being sold to China. They are paying us for the ease of transportation and right of way. 4) It will provide 20,000 more jobs, for the short term. There will be a small amount of long-term jobs added to the US economy as a result, mostly down in Texas refineries. This is good for Houston, so I won’t complain. 5) The “tar-sands” issue is a little tricky. I have worries about environmental effects. The pipeline addition will add 1.2 billion metric tons of carbon pollution to the atmosphere during its 50-year lifespan. However, if the pipeline doesn’t go through, it’s not like it will stop the production or flow of this “tar-sands” oil. There is already approval and movement towards a pipeline being built running east to west in Canada. They don’t need us, necessarily – the oil will still get refined, this way or that way. Or, if the oil cannot be refined, it would be replaced in the world market by oil from Venezuela, which is even “dirtier”, but who, as a country, is not as friendly with the US. 6) I worry about the safety of the pipelines long-term, about spills and leaks into the ecosystem. However, leaks and spills can come from trucks and trains carrying the oil from one place to another, just as well as (if not more often) than it can come from a defect in a pipeline carrying it from one place to another. 7) I think the solution eventually is for us to kick the oil habit, but that is not going to happen over the this generation, or the next. We have a long way to go before we can become independent of oil as an energy source. Here is a map of the proposed new route. 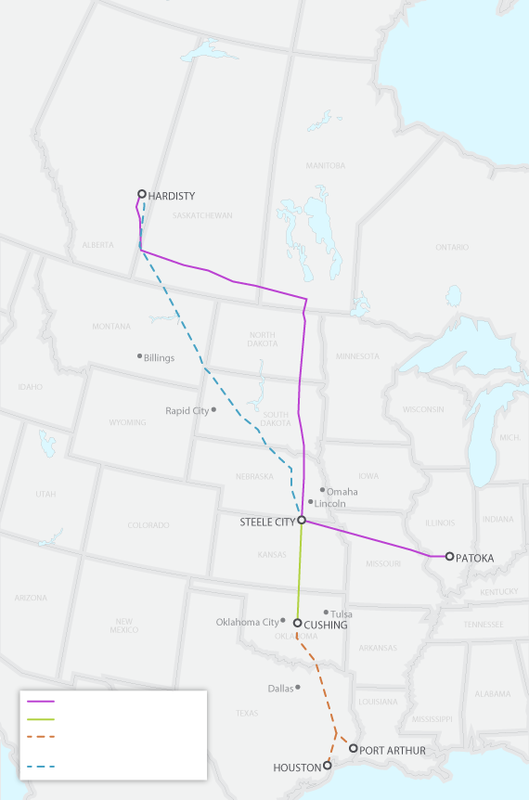 The current Keystone Pipeline is the purple solid line. The dotted blue is the Keystone XL proposed route, and the yellow and brown are the additional paths to be added later. Right now the government has postponed making a decision on this until 2014. I am not actually that hopeful that the environmentalists will win, although they are my “dog in this fight”. The environmentalists won before, with Nixon and the Trans-Atlantic pipeline in Alaska, in 1970-1972, but Nixon and the governmental seat found a way to get around them and build that darn pipeline anyway. That is probably what will happen again. We’ll see as this momentum continues to build. I haven’t had much to write about/felt like writing on here lately. We’ve been busy at home with kids and school and sports. Hopefully soon I will have some more outdoor adventures to write about.